← Savoring the summertime. Loving each moment. pinterest challenge project phase 1, originally uploaded by ordinarymoment. 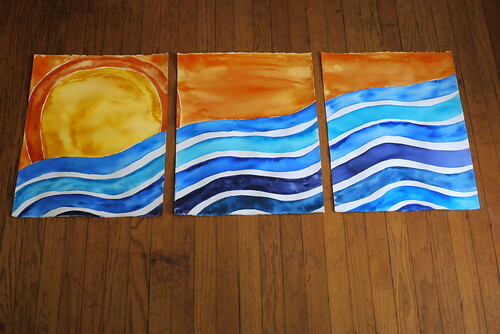 One of my favorite parts of summer is the extra, uninterrupted time for creative pursuits. We needed some bright, large art to hang in our living room and when I came across this Pinterest challenge over at Young House Love, I decided to go for it. In case you were wondering, Pinterest is an amazing, addicting site where you “pin” inspiring images to virtual bulletin boards, where you can then browse through later for ideas + eye candy. It’s pretty fun! So after loving this abstract watercolor, I knew I wanted to do something with bold, flowy paint. I came across this beauty and went from there. Thanks to my Michael’s coupon, I got a three pack of 16×20 Arches watercolor paper for about $7.50. Used the watercolors I already had and spent a blissful afternoon painting away. The finished paintings are currently in the process of being flattened as we speak, then Mr. Matthew will help me build the frames to adhere the paintings to. I will post another photo of the finished project hanging in our living room. So exciting! Don’t forget to check out the Young House Love project, pretty nifty! This turned out great! What beautiful colors. Thanks so much! I’ll post another photo once they’re all hung on the wall.